Strangely enough, I do not notice Near Dark being written about or screened very often anymore. It has certainly disappeared from cable. It is not on Netflix Instant. I wonder why. I absolutely loved it when it first came out. I still love it. Near Dark is a hybrid of vampire movie and Western. It is an interesting mix. Most westerns posit a conflict on a frontier between two groups of people, usually the farmers and the cattlemen. The farmers want to lay down roots and build towns with schools and churches. The cattlemen prefer to roam nomadically with their herds and do whatever the hell they want. In Near Dark, the role of “farmer” is played by our hero Caleb, who considers his safe, small-town life to be boring and seeks excitement. The “cattlemen” have been transformed into a roving band of psychotic bloodsuckers. THE PLOT IN BRIEF: Caleb Colton (Adrian Pasdar) allows himself to be seduced by a young lady (Jenny Wright) who turns out to be a vampire. She introduces him to her eccentric extended family: Jesse (Lance Henricksen), the “father;” Diamondback (Jeanette Goldstein), the “mother;” and crazy “brothers” Severn (Bill Paxton) and Little Homer (Josh Miller). 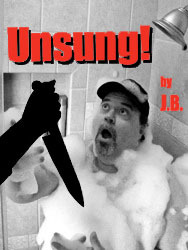 After witnessing the family stage a killing spree in a hometown bar, Caleb tries to escape and return home. He finds that escaping this wild bunch will not be easy. JUST LOOK AT THAT CAST: The cast of Near Dark is something of an Aliens reunion, which is no surprise, considering director Kathryn Bigelow was married to James Cameron at the time. (I would watch a movie of this cast having lunch.) We have Henricksen, Paxton, and Goldstein from Aliens. We have Adrian Pasdar, who would later marry Natalie Maines from the Dixie Chicks and appear in every TV series ever made (Mysterious Ways, Judging Amy, Desperate Housewives, Heroes, and Castle, to name a few). You have Jenny Wright from Pink Floyd The Wall, The World According to Garp, and I, Madman. (Jenny Wright actually dropped out of sight for a while — on the Near Dark DVD commentary track, Adrian Pasdar actually asks her to get in touch with him — but recently, she has resurfaced [thank goodness] at horror fan conventions.) And we have creepy Josh Miller from The River’s Edge; he is the son of Jason Miller, who played Father Damien Karras in The Exorcist. Talk about your horror movie bonafides. In the same way that The Road Warrior and Blade Runner determined how the future would look in movies for two decades or more, Near Dark had a very real influence on later vampire films; many of the “new” tropes you may have seen in your favorite recent vampire films were pioneered by Near Dark. Although we all know that vampires are “not allowed” in daylight, no film before Near Dark was quite so specific (and graphic) about what happens when vampires break that rule. This lends a special irony to the film’s daylight motel shootout scene: the vampires have no fear whatsoever of police bullets but are deathly afraid of the rays of sunlight that “shoot” from the bullet holes in the motel walls. That motel shoot-out is one of the three great scenes this movie contains, which qualifies it, of course, for great movie status. An earlier scene at a rural tavern — in which a family night out turns into a violent tour-de-force — is also a highlight. (After you see it, you will never eat Kentucky Fried Chicken the same way again.) The film’s final scene is also quite memorable; it owes something to James Cameron’s Terminator and deals with dispatching vampires via semi truck. The film features much of this dry, comic, and endlessly quotable dialogue; I do not wish to spoil it by repeating any more of it here. The word “vampire,” by the way, is never uttered in Near Dark. Not once. How cool is that? *If it were not for the excellent Let The Right One In, Near Dark would be the best vampire film WORLDWIDE of the last twenty-five years. You'd think Bigelow winning the gold statuettes for "The Hurt Locker" (including breaking the glass ceiling for female directors winning a Best Director nod) would have led to her previous work getting re-evaluated. Hasn't happened yet, and it doesn't help that "Hurt Locker" was the movie that won Best Picture that's made the least amount of money at the box office. Personally her movies leave me cold despite being technically solid and well-shot. I think characters in Bigelow movies are seldom as interesting or relatable as the one's in, for example, James Cameron flicks. Both can direct, but with Cameron you care deeply about the characters ("Titanic") while with Bigelow you don't really give a damn whether Ford can save his submarine crew or not. She's Frank Marshall/Kathleen Kennedy/Joe Dante without 'Steven Spielberg Presents' mojo, IMO. 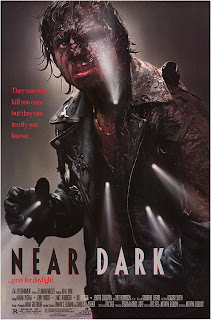 I like "Near Dark" on principle and because it reads like I should like it (great premise, good cast, interesting characters, well-done set-pieces, etc.) but, the five or so times I've seen them since the early 90's (last time a few years back on premium cable), it doesn't do much for me. Part of it is that Bigelow is an action director (because "Point Break," 100% pure adrenaline, yada-yada-yada) and "Near Dark" feels more like an action movie that happens to feature vampires than anything supernatural, scary or horror-related. I have a personal bias against horror movies that get lazy and torch/burn/blow-up stuff at the end ("Halloween II," "Friday the 13th Part VII," "Maniac Cop 2," etc. ; even good horror flicks like "From Beyond" fall prey to the 'let's blow the house' temptation) to substitute for actual shock moments because, to me, fire/explosion does not equal scary/suspenseful. While "Near Dark" is different because the daylight is shown as the vampires' deathly enemy, every time I see someone on fire/burning (and in "Near Dark" it happens a lot) it's just not scary or horrible. It's a fine genre picture that milks its small budget ($5 million) for all its worth, but I honestly can't even think of it as a horror movie. To me its a balls-to-the-walls action flick first, vampire flick a distant second. Over the last couple of years one of the film channels here in the UK has shown Near Dark pretty regularly, and after a few people whose opinions I respect very much recommended it to me I finally got round to watching it a year or so back. I could kick myself for not seeking it out sooner. It comes up pretty often amongst the people I talk about films with, and is universally liked. The scene of the massacre in the bar is outstanding. The build up is so creepy and filled with genuine menace.